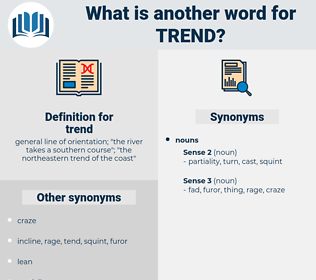 What is another word for trend? 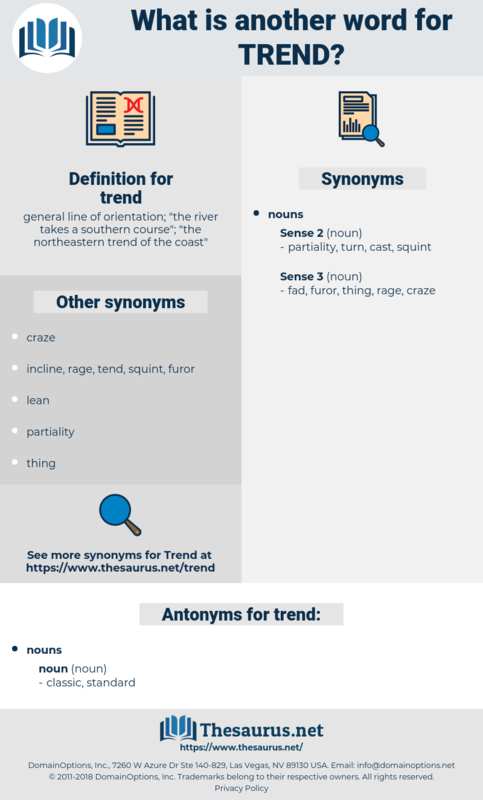 general line of orientation; " the river takes a southern course"; " the northeastern trend of the coast"
Regulations, tide, phenomenon, Phenomena, decline, drift, thrust, posture, temptation, curve, decrease, tradition, bias. tending, declining, decreasing, increasing, rising, emerging, leading, showing, going. Tended, concentrated, reversed, Paced, Evolved, developed, inclined, Happened, Tempted. tends, proceeds, develops, continues, evolves, appears, happens, unfolds, moves, applies, transitions. Attitudes, Trended, direction, directions, evolution, pattern, patterns. propensity, inclination, penchant, direction, situation, mainstream, turnaround, attitude, evolution, pattern, preference. Before her husband could make any response to this, the whole trend of the conversation was altered by the boy. Just when you called me in, one of the girls thought she had a trend.